Name of booth: IMT Co., Ltd. 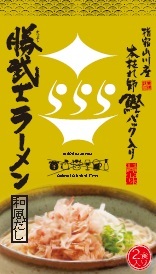 Feature: This is a tasty soy sauce ramen that is topped with Hongarebushi, the highest grade of katsuobushi bonito flakes that are not easily obtainable. Plenty of Hongarebushi from Japan No.1 Production location Kangoshima Prefecture’s Ibusuki city. Yamakawa is used, making the product stand out with its high quality flavor, taste aroma. It is a taste loved by all.The luxury of Hongarebushi is repressented by the gold packing. ← MBIC Life Co., Ltd.